We accept files from 4 graphic applications (Quark Xpress, Adobe Photoshop, Adobe InDesign and Adobe Illustrator). It is best if you can send us your art files in a PDF format, just make sure all the art is at lease 300dpi (dots per inch). We have a further explanation of file resolution and file format setups below. If you are using any other application please save your files in one of these formats listed (PDF's, EPS, or TIFF). In all cases please convert all your fonts to outlines. Below are instructions on how to save your files to make them print ready. 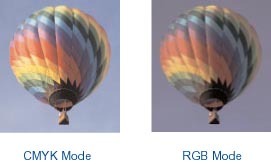 • Save all photos in CMYK MODE, not RGB MODE. Images saved in RGB mode will not print properly. • Images or photos should be saved at 100% (full size) and placed in your document at that size or smaller at a resolution of 300 dpi (dots per inch). Enlarging an image in your layout could cause the image to start looking blurry or bitmapping. 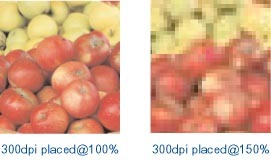 • You should know that photos under 300 dpi will start to look blurry. 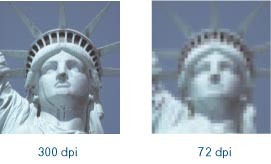 Keep in mind that most images taken off the Internet are 72 dpi and far too low resolution for printing. Many layout programs have collecting or packaging functions that will automatically collect your document, fonts, and all art. When possible, it is recommended to use these functions because without any or all of these elements we will be unable to print your postcard. • Safety: All art and text within this safety area will assure that nothing will be trimmed off during the cutting process. A 1/16" guide in from the trim should work fine. 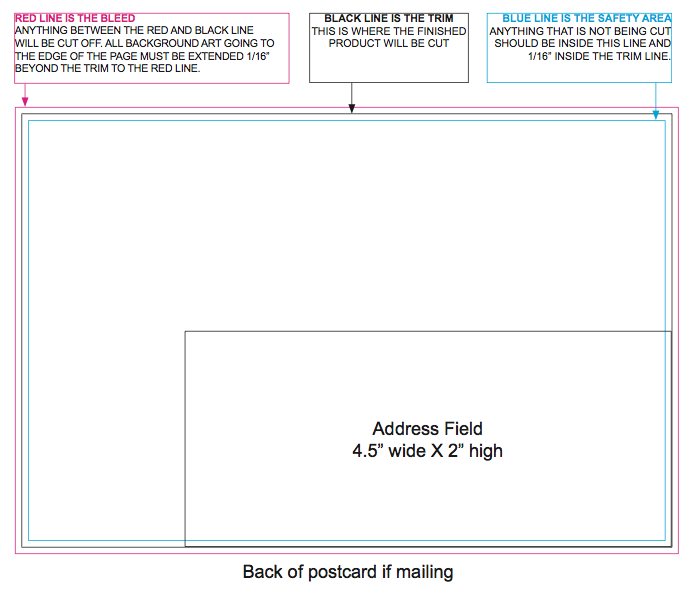 Below is a visual reference template on file set up for all postcard sizes. When mailing a postcard, you need to have the return address on the back of the card. However, you cannot place the return address too close to where the mailing address would be, because the Post Office might read the return address as the mail-to address. If you cannot avoid this, then invert the color by making the text white, and put a colored box behind it. The Post Office will not read inverted colors. 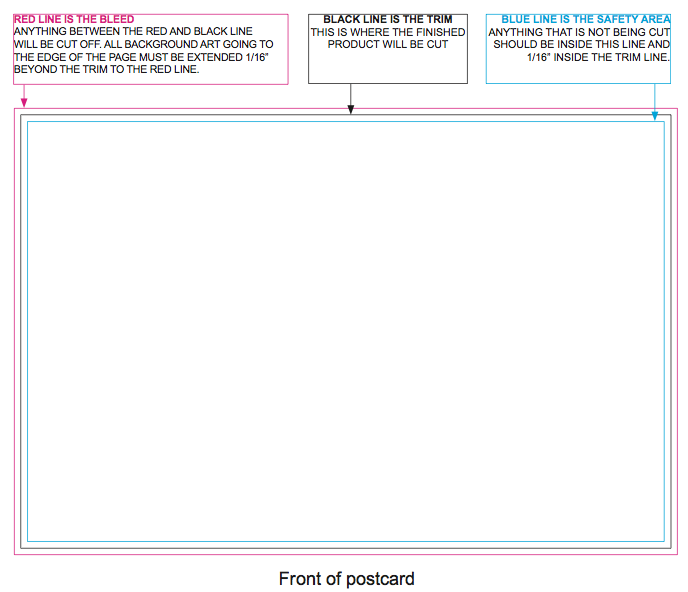 The picture below details how you should lay out the back of the card. For more information on how to set up your design to mail properly, please see the United States Postal Service’s Domestic Mail Manual. All our jobs print CMYK. If your job has Pantone or RGB colors in it, they will be converted to CMYK. This will sometimes drastically change the appearance of colors. We will send you a PDF proof so that you may see this. In order to print correctly, double-check the size of your document. We accept data in 2 formats: XLS and CSV. XLS is a Microsoft Excel Spreadsheet. CSV is an acronym for “Comma Seperated Values.” Both are industry standards, and most programs can export either of these formats, if not both. If we are mailing your job, make sure to leave room for a Postage Permit in the upper section of the Mailable Area. Generally Postage Permits are a 1” square, but in cases of a smaller postcard, can be as little as .75” square. PC Version – this program is FREEware – you NEVER have to pay for it! Mac Version – this program is SHAREware – you get a TRIAL version.